Domain management should be easy. We make sure it is. Domain management should be easy. 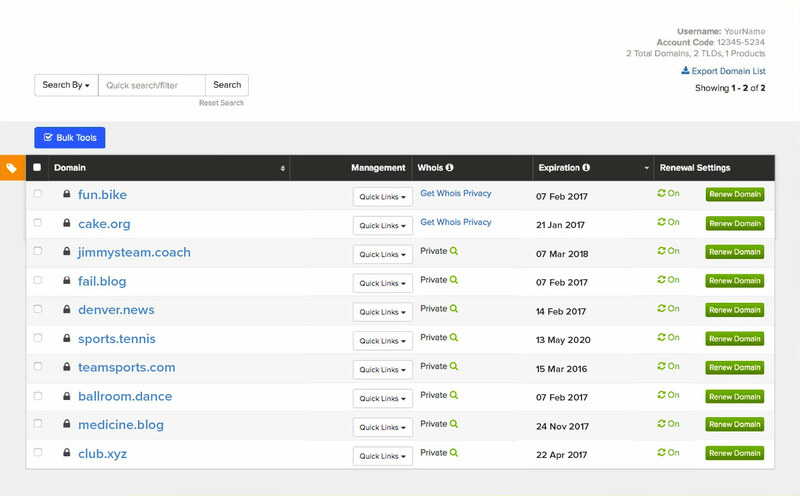 We want you to spend less time managing domains and more time making things happen. Our domain, product, and account management systems keep you in mind from start to finish. 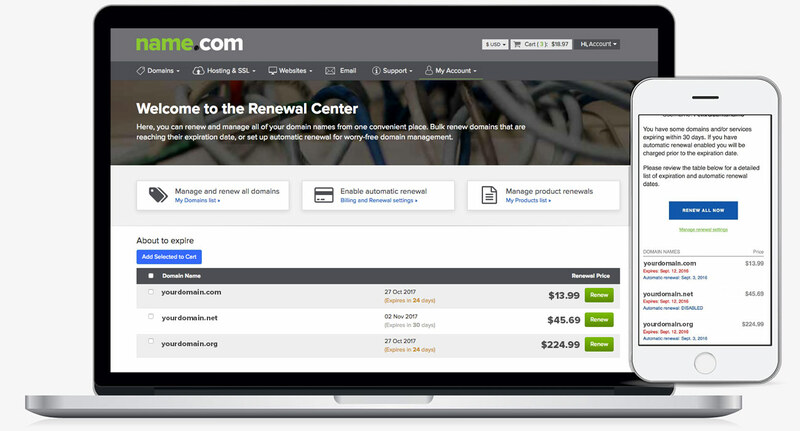 Timely emails and the Name.com Renewal Center ensure you'll always know when domains are about to expire. "I switched domain and hosting providers to Name.com three years ago because I found that Name.com's process was much simpler to implement than my previous provider. Also, I enjoy receiving personable and timely technical support when I am having trouble with certain aspects of my website. Thanks, Name.com!" “I really appreciate how Name.com provides straight-forward ways to get domains and also to let them lapse - when the time is right. This makes me more willing to sign up for a domain I might use. Your system is clear and efficient. So, thanks. Nice doing business with you." "It's hard to believe it's been almost 6 years since my domain was stolen and then subsequently recovered by Name.com. Sounds like hyperbole but your efforts changed my life. Had I not gotten that domain back, I'd probably never have made it to Mozilla … I can never, ever thank you enough for what you both did for me. You're legends!" Extra security for more peace of mind. 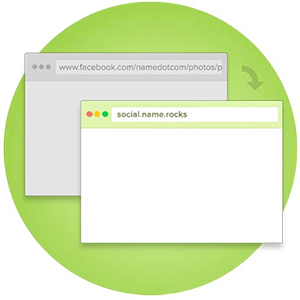 Name.com supports additional free security features to help you keep your account safe. When logging into an account protected by Two-Step Verification, a rotating 6-digit code (which is generated on a third-party app) must be entered in addition to your username and password. If you have a static IP address for your home or business, add IP restrictions to your Name.com account so that it can only be accessed via a whitelisted IP.